Your littlest one is feeling a bit useless around the house; his older brother has chores and gets an allowance for helping out and his older sister is responsible for taking care of the family pets. But your young hero wants to hel, too; he wants a really tough job to prove that he's all grown up. How about the protection and safekeeping of the family bunker? After all, being on a SWAT team is one of the toughest jobs there is! 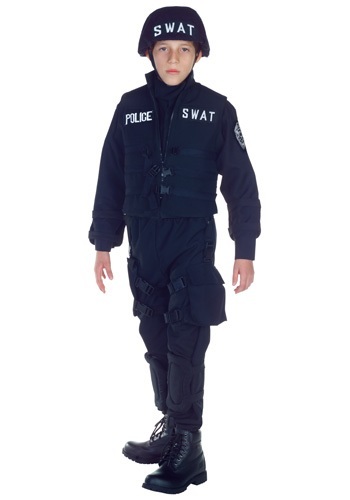 When he wears this Kids SWAT Team Costume, he can feel like he is helping to serve--his family, his home, his community, even his pet turtle--in the best and bravest way. Of course, there’s no real danger facing you and yours, but he doesn’t need to know that! Give him some super-important specialist tasks--like taking the trash out (to combat biochemical warfare), cleaning his room (and checking for bugging while he’s at it), or raking the leaves (to make sure no enemies are hiding under the foliage). The possibilities to motivate him are really endless when he’s driven by the desire to serve and protect to the highest degree. Of course, there’s a whole other level to this costume, and that’s its usefulness! Now that he’s his own hometown hero, this costume can be used for playtime or an ideal Halloween look. With its official looking badge and logo, this suit will have him ready to take on responsibility like a pro in no time. Once his helmet is secured he is ready to take on the daunting task of being the little guy everyone calls on a crisis. It would almost be cute if he wasn’t so deadly serious about his new job! I still need to hem the pants, but posted measurements are true to size. The fabric is durable enough; pouches that are meant to go on leg only have 2 elastic straps to hold in place, but a well-placed safety pin will help. Entire costume creates a nice overall look. No add'l accessories needed.